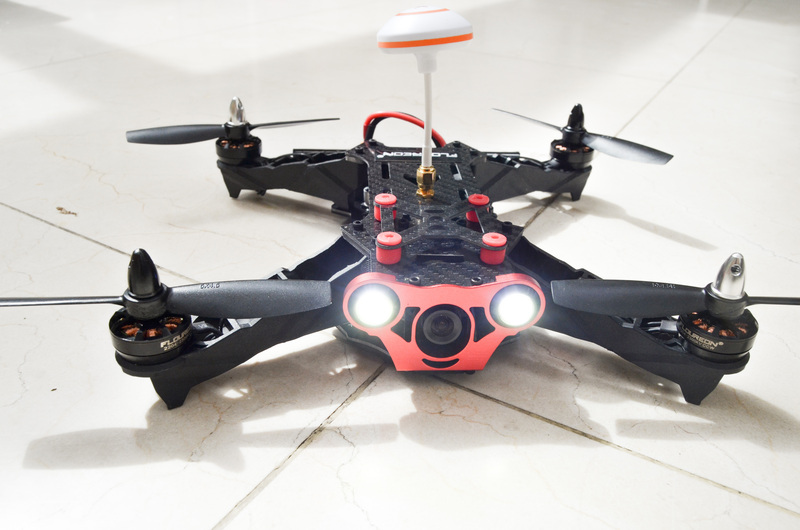 The Floureon Racer 250 is an upgrade to the Eachine Racer 250. Both the Floureon and Eachine look and feel very similar, but this article will explain why I think you should buy the Floureon Racer 250 due to the fact that it is much faster, easier to use and is ultimately more enjoyable to fly! Buy the Floureon Racer 250 here. In a nutshell, the Floureon Racer 250 comes equipped with a Naze32 flight controller, 20A ESCs and a 1000TVL FPV camera. You also receive a handy 7″ monitor in the box too for FPV flights. The drone is both powerful and quick making it perfect for any intermediate flyer who is looking for a relatively cheap quad that will challenge them. This article will firstly review the Floureon Racer 250 (exposing both its positives and negatives) and then it will compare it to the Eachine Racer 250. Enjoy! It came well packaged in two padded compartments. Nothing was damaged or scratched. However, there were no instructions on how to mount the FPV monitor onto the transmitter. I managed to figured out how it was done pretty quickly though! The Floureon Racer 250 came pre-assembled meaning it was really quick and easy to set up. 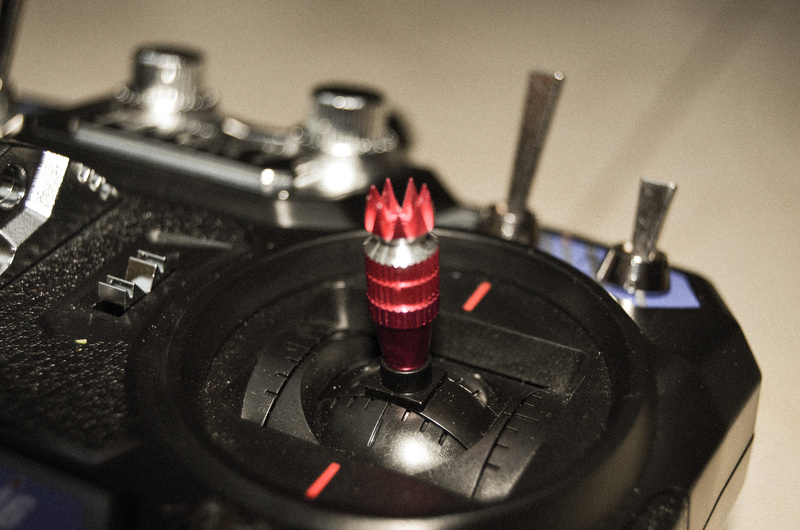 Simply screw on the 5″ props, remove the camera lens cover, add the antenna, plug in the batteries and your ready to fly! Front view of the Floureon Racer 250. It seems to have a smily face at the front. The lights are 3 watts making them very powerful. In between these lights, there is a 1000TVL NTSC camera. Back view of the Floureon Racer 250. It has a huge LED bar light that can be turned on and off manually. Top view of the Floureon Racer 250. There is a vibration plate that you can use to attach an action camera. Floureon Racer 250 Motors – The motors are 2300KV. So the first thing that I noticed was that the Floureon Racer 250 was very responsive to any command that I gave it. It is very ‘sharp’ when turning, which I was pleasantly surprised by given its weight. I tuned the Floureon Racer 250 by raising the yaw through increasing the P and D. The Naze32 combined with Cleanflight means that all of my adjustments were noticeable during my next flying experience. The quad was also pretty stable in both Acro and Standard modes. I did notice however, that as the battery depleted, it became more wobbly and harder to control. Also, the range on this thing is fantastic. 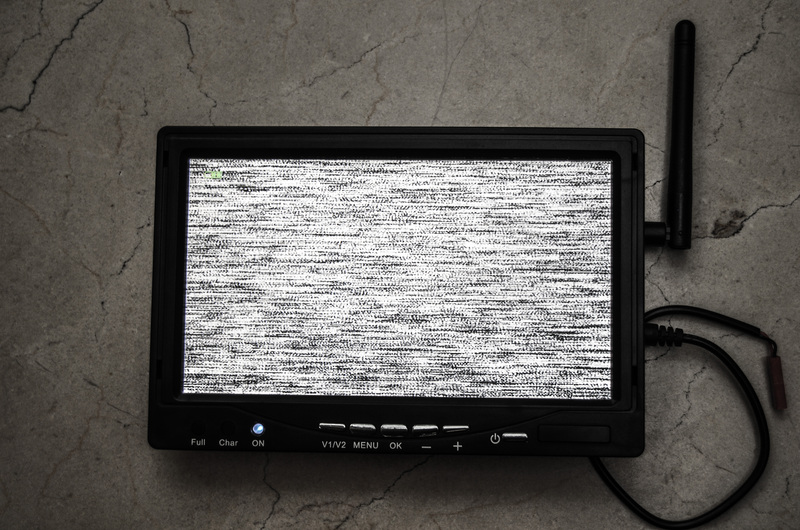 The 7″ monitor has a dipole antenna and whereas the quad is using a cloverleaf antenna. 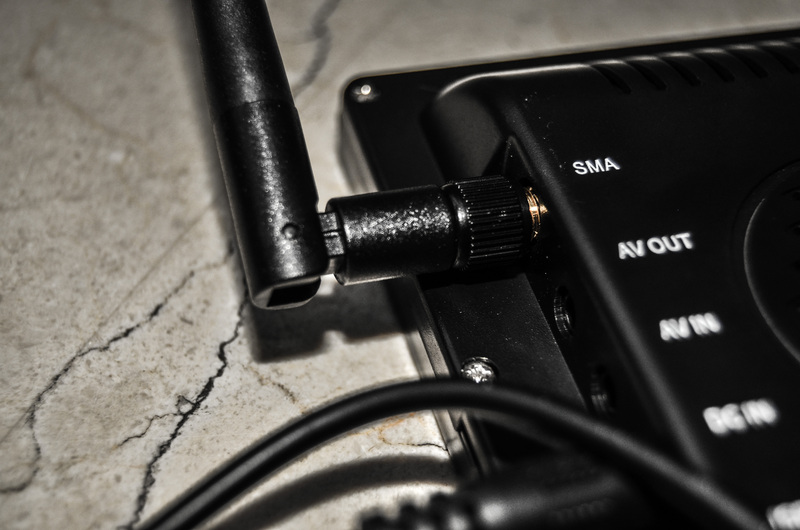 Usually you would think that the different types of antennas would affect the range. However, I found that I could fly this thing over 500m away without having a complete breakup. Range is definitely not an issue with this drone. I also thought that the 7″ monitor was very good. It was relatively vibrant and you could still see it when placed in direct sunlight. The main issue with the flying was to do with the 1000TVL FPC camera. Firstly, you cannot adjust the camera angle without any external modification which was rather annoying. Secondly, the camera did not handle very well in different light conditions. When flying in the evening (when there was reasonable light), the camera did not adjust the to the light meaning that discerning objects on the FPV screen was rather difficult. Also, if it was particularly bright, the camera would be overexposed and once again it would make it hard to fly in FPV. Also I was surprised that the ESCs don’t have the oneshot 125 feature. This is because they run on an older firmware. If that is a feature that you desire then you might wan’t to stay away from this drone. Finally, when flying, although the range was excellent, occasionally the VTXs SMA connector came into contact with the 3K carbon fiber top plate. This reduced the range and meant I could not fly very far. I’ve only experienced this issue once, so I don’t really think you should worry about it. The drone itself has a 1.5mm upper plate that is made from 3K carbon fiber. However, all of the arms are made form nylon which is heavier and less robust than carbon fiber. I personally would have liked these arms to be made from 3K. Nevertheless, the nylon arms seem pretty tough and they did not snap despite me crashing the drone multiple times. Also, if this is an issue, it is very easy to switch out the arms and replace them with your own. 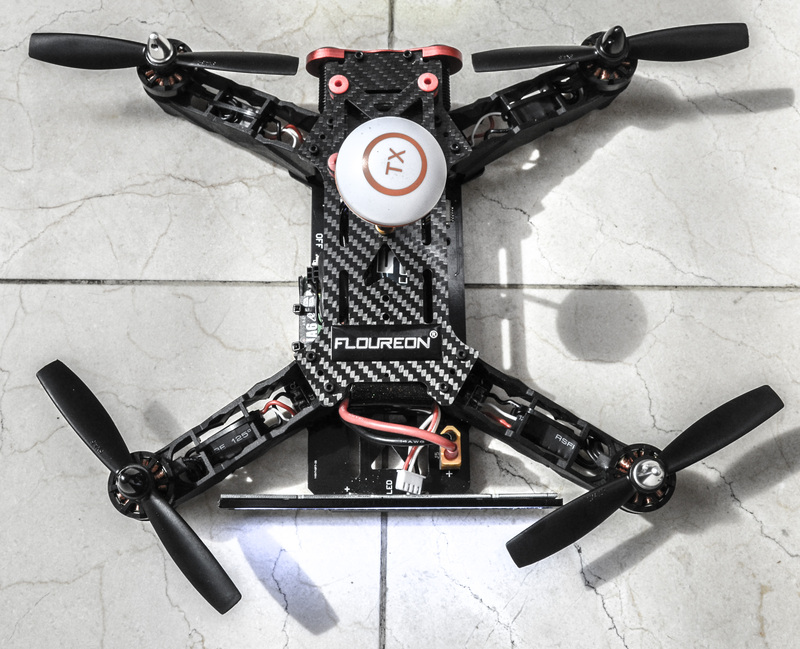 The Floureon Racer 250 weighs 525g when fully assembled. The lack of carbon fiber arms definitely add to this weight. Overall, 525g is not that heavy, but there are lighter drones out there on the market. 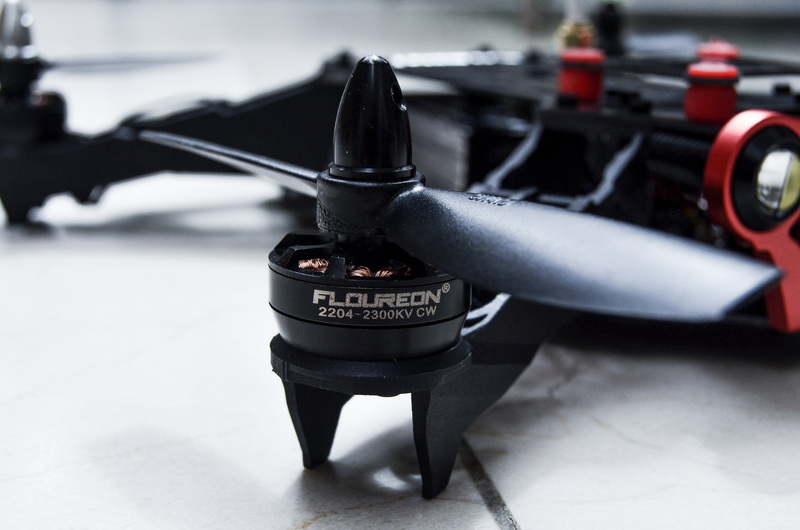 I was initially worried that its weight would impact its flying performance, but as I will explain later, the Floureon Racer 250 is very powerful meaning it is still really quick and agile! On the bottom of the quad, there is a 1.5mm fiber glass plate that has been covered in foam. It also has a built in PDB. Again, this seems pretty sturdy and did not crack or break despite crashing at high speeds numerous times. The only thing that I am slightly worried about is that there maybe a weakness in the middle of the frame due to the fact that it has virtually no support in the centre. However, the frame held out very well during my vigorous tests (i.e when I crashed) and nothing broke. 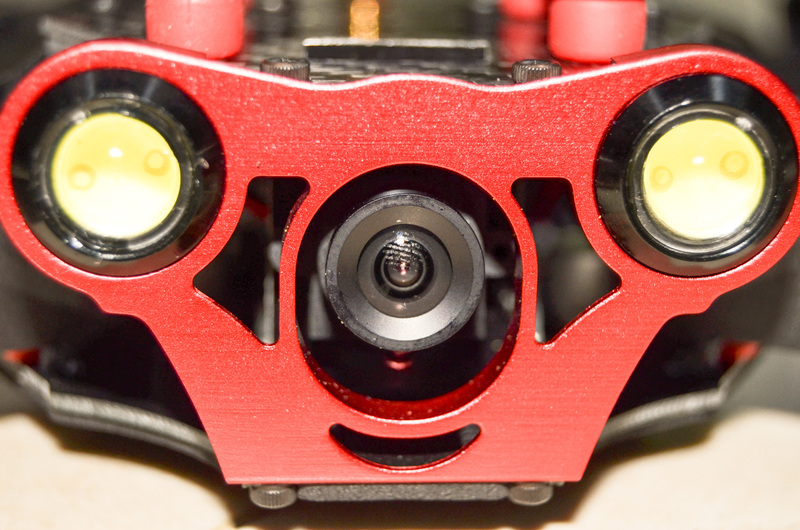 As you can see from the pictures above, the Floureon Racer 250 has some ultra bright LED lights on the front and back of the quad. This is really useful if your flying in FPV since the person behind you can easily see where you are. Also, it makes night time flying a heck of a lot easier too. I was really surprised by how bright these lights actually are. If anything, they are almost too bright – but you can be 100% sure your not going to lose your drone on a dark or foggy evening. Whilst the Floureon Racer 250 does have some practical drawbacks, I think that the pros massively outweigh the cons. If you buy this quad, I guarantee that you will be satisfied and you will enjoy using it. Therefore, the next logical question you should ask yourself is “should I buy the the Floureon Racer 250 or the Eachine Racer 250?” Keep reading and I will answer that question! The Eachine Racer 250 has 12 Amp ESCs whereas the Floureon Racer 250 has stronger 20 Amp ESCs. So as you can see, on paper, the Floureon Racer 250 is far superior to the Eachine Racer 250. 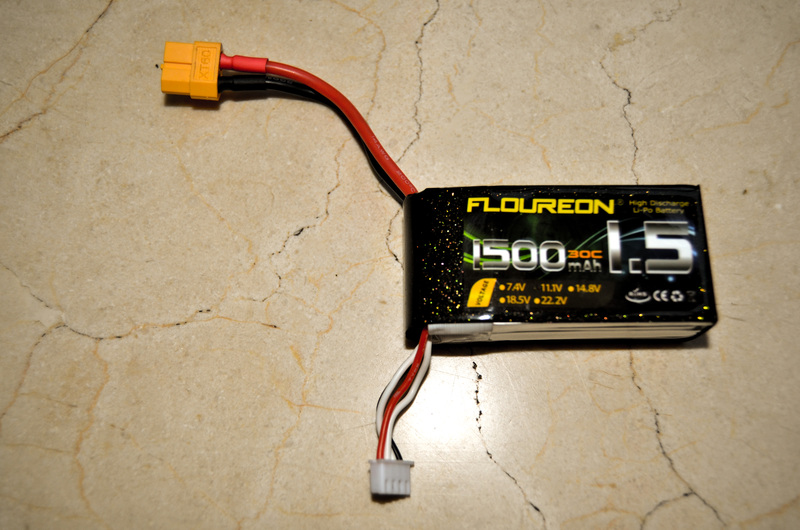 However, the Floureon performs better than the Eachine when flying too. When in flight, the acceleration of the Floureon is noticeably faster despite being slightly heavier. This is because it has more powerful motors. It generally responds to instructions faster and just ‘feels’ better when flying. 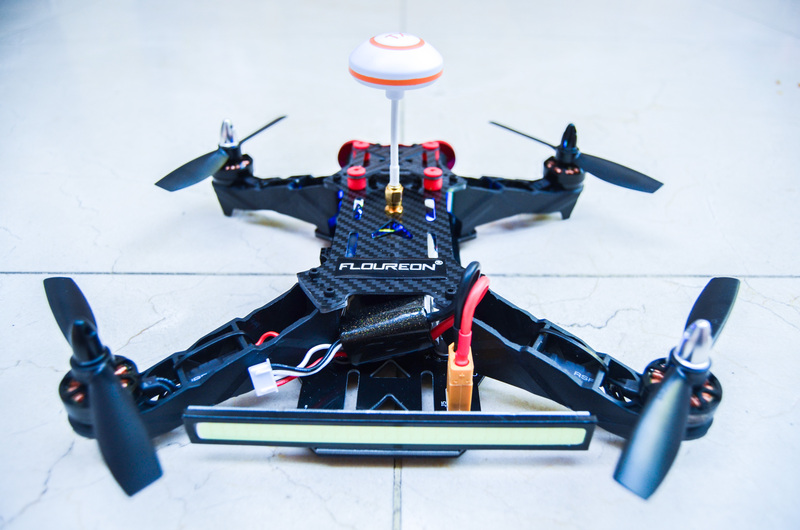 The Floureon Racer 250 also has a better range and is generally more exciting to fly. 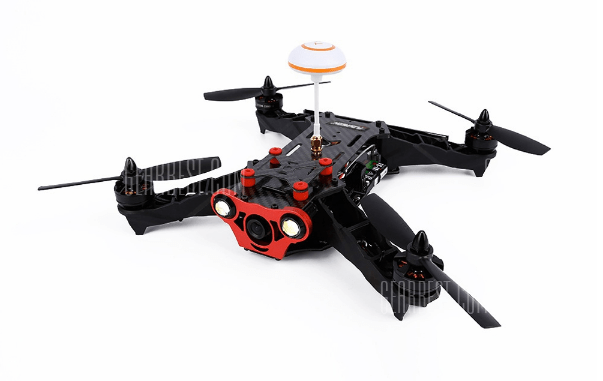 The Eachine Racer is cheaper, coming in at $130 whereas the Floureon Racer 250 is $243. However, the Floureon Racer comes equipped with a 7″ FPV monitor and a Flysky Transmitter meaning your getting much more for your money. I have used both the Eachine Racer 250 and the Floureon Racer 250, and I love them both. 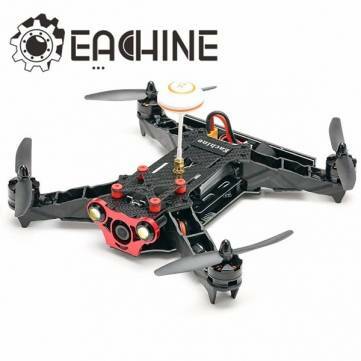 However, the truth is that the Floureon Racer 250 is an upgraded version of the Eachine Racer 250 meaning that it is more exciting and enjoyable to fly. Therefore, I highly recommend that you don’t buy the Eachine Racer 250 but instead get yourselves a Floureon Racer 250 since it is a better drone and you get much more for your money. Buy the Floureon Racer 250 here. Cannot get parts for Floureon such as PCB, the eachine PCB is not compatible, I own the floureon..
Yeah, until you Break the pcb, then u tot a problem. 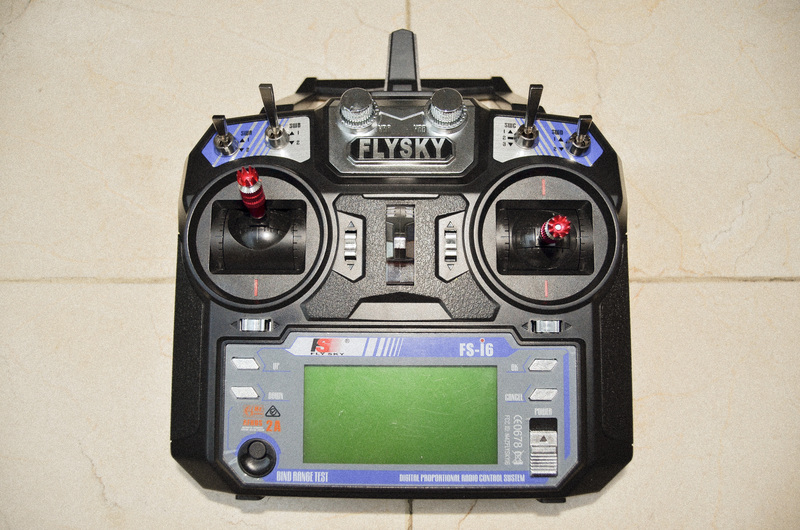 Btw, u can buy the Flysky transmitter and 7inch screen including a rc840 video reciever for less then 90 euro’s! Yeah, until you Break the pcb, then u got a problem. Btw, u can buy the Flysky transmitter and 7inch screen including a rc840 video reciever for less then 90 euro’s! First of all thanks for your review. Quite nice. I’ve got one. It’s quite good indeed however one of the ESC unfortunately is not working. I am in touch with them but honestly it will take ages to get a new one. Anyway I would like to ask which way is the best to charge the 7″ monitor and how can we configure the system on cleanflight? It seems blocked. I hope to get some help from here because I don’t know anyone with this model so far.